With Christmas fast approaching, cold nights drawing in and many places getting a good dump of snow, it would be just perfect to have a snow filled game for this season. 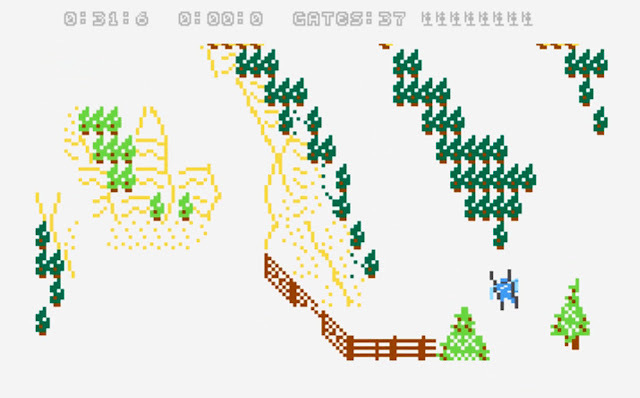 Well if you're looking for a game with plenty of snow, then look no further than Jason Kendall's 'Ski-It'; a down hill skiing game developed for the ABBUC Software Contest in which you need to ski down the slopes, pass through the gates and try not to lose all your lives. True it's not an action platformer, a shooter or a game that screams high quality Atari graphics, but damn is Ski-It a lot of fun! There's nothing more satisfying skiing as fast as you can down the slopes while trying to avoid slamming head first into a tree. But what else is satisfying you might ask? That ever increasing time counter which gives the game that extra playthrough, pushing you ever forward trying to beat your previous time score! It's a bloody fun game and if you've got the time well worth playing.